Not every project can be a success. It happens to the best of us, right? There were at least five things that did not work out quite as I planned. 1. 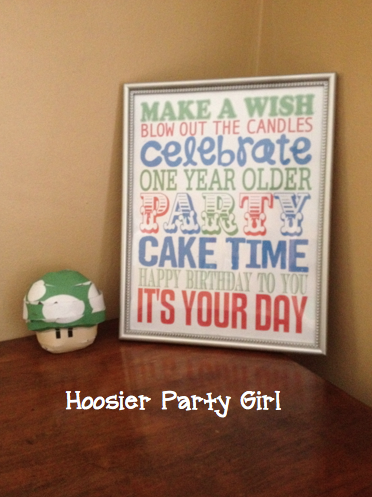 Nintendo Party Craft has an extensive list of print and make Mario crafts. It looked so easy… it was not. After hours of cutting, folding, gluing, and re-trying, I was left with just this one little guy who wasn’t fully put together. Everything else got trashed. The subway art is from eighteen25. 2. 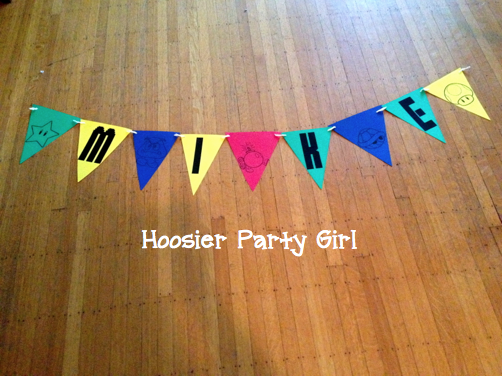 The birthday banner was something else that I thought would be easier. My major mistake was using the letter size paper template on my computer, but cutting 12×12 paper to 8.5×12 to print. I am not totally familiar with the printer I used and it re-spaced things the opposite than I expected. It also sucked up one of my pages early, upsetting the color balance I had planned out. 3. 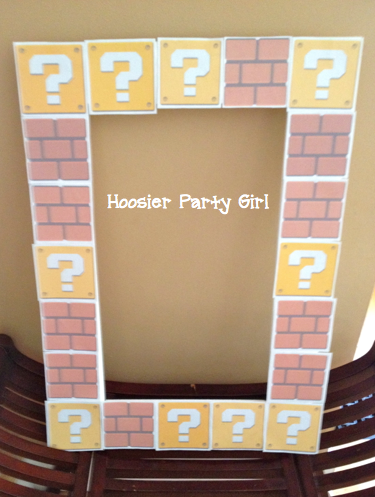 Rather than a photo booth or backdrop, I put together this frame to incorporate the bricks and question boxes from Super Mario. My printer woes continued and these did not print nearly as saturated as I would have liked, even after I played with the settings for a while. 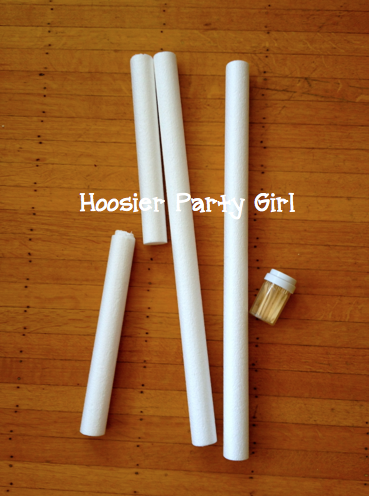 Originally I was going to print directly on to strips of poster board (two for $1 at Dollar Tree! ), but the printer rejected that idea. I ended up printing them on regular paper, then gluing to the poster board squares, which I then attached to a styrofoam frame I had made out of toothpicks and styrofoam from Hobby Lobby. 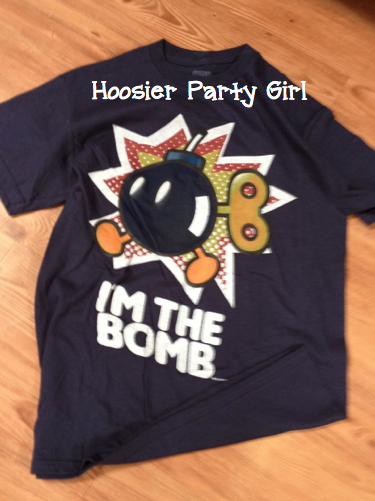 (and before he put on his I am The Bomb t-shirt). 4. While the main cake was 143 mini cupcakes in the shape of 8-bit Mario, I wanted a special birthday cupcake with candles. 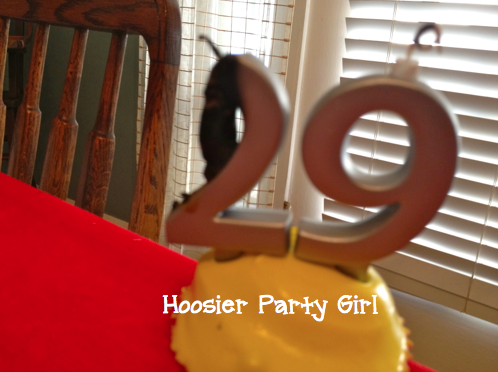 I didn’t really expect the candles to be blown out for a 29th birthday party, but they were…. 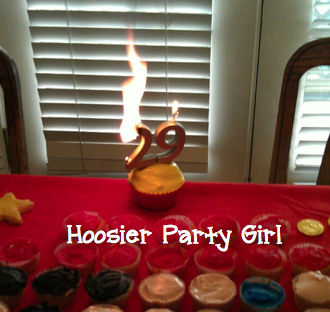 because when I walked my parents out to the car, my numerical candle holders caught fire! Well, I guess I won’t be reusing the 2! 5. Not everything you read on Pinterest is true! I tried to freeze balloons to make a fancier drink cooler. I ended up with lots of water in my freezer and on my floor – right as the guests started arriving. My fabulous friends came to the rescue though. Beware of this pin and others like it! 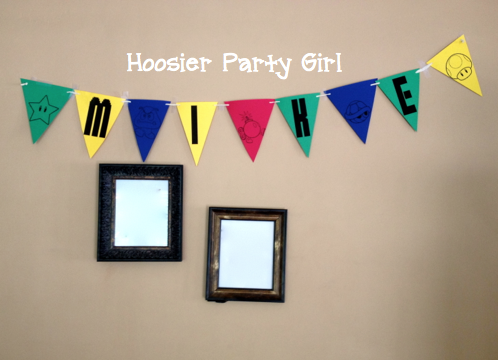 AWWWWwwwwwww this blog made me giggle but I hope the party was a blast despite the mishaps! 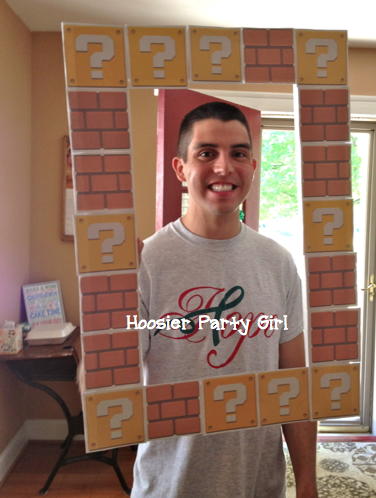 Btw, the mario frame is FANTASTIC! Oh, it absolutely was. I’ll post more of the successes this weekend. Thank you so much. It got a great home with an enamored three year old – what could be better? hahaha maybe the three year old will be obsessed with mario and you can plan another mario party for when he/she turns 4!